The primary objective of target costing is to enable management to use proactive cost planning, cost management, and cost reduction practice whereby, costs are planned and managed out of a product and business, early in the design and development cycle, instead of during the later stages of product development and production. It obviously applies to the new product, but can also be applied to product modification or succeeding generations of products. It might also be used for the existing product, but costs are more difficult to reduce once a product is developed and designed. 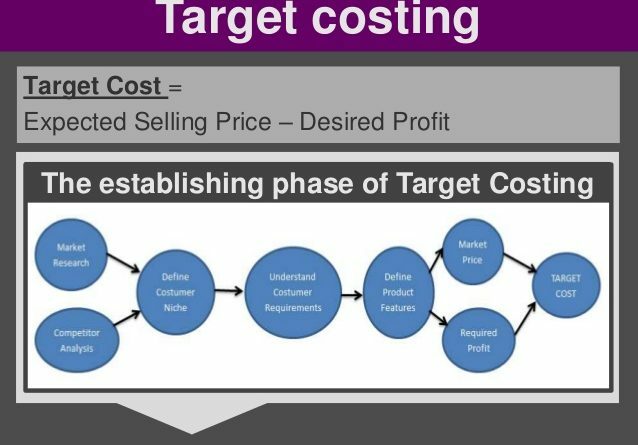 Target costing is as much a significant business philosophy as it is a process to plan, manage and reduce cost, it emphasises understanding the market and competition. It focuses on customer requirements in terms of quality, functions, and delivery, as well as price; it recognises the necessity to balance the trade-offs across the organisation and establishes teams to address them early I the development cycle; and it has, at its core, the fundamental objective to make money, to be able to reinvest, grow and increase value. To lower the cost of new products so that the required profit level be ensured. To motivate all the employees of the firm to achieve the target profit during new product development by making target costing a company-wide profit management activity. For any system to be effective in sporting decision making in an organisation, the staff from the relevant departments must come together in order to tap their creativity so as to achieve goals. In another word, the company requires a non- conflicting and rational system for consensus building and decision.